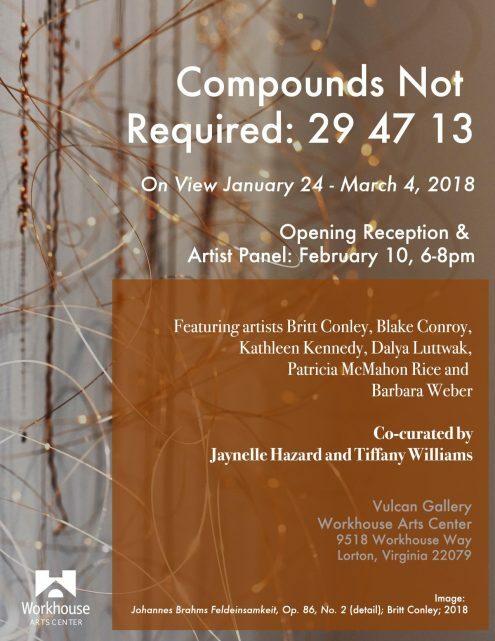 It’s been a joy, to be a part of the show, Compounds Not Required: 29, 47, 13 in the Vulcan Gallery at Building 16, at the Workhouse Arts Cin Lorton, VA. The opening reception will be from 6-8pm on February 10th. The show dates are January 24th – March 4th. I’ve been working on six works of art for the exhibit. 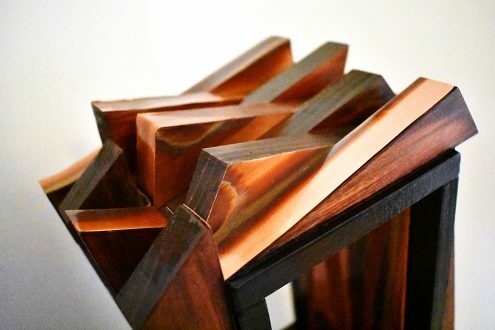 Interval Sea, Incorporates wood and copper. 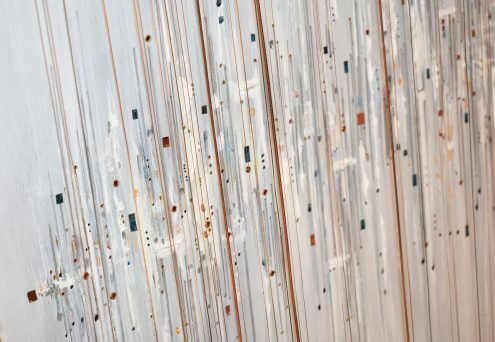 I wanted to create a work that represents the essence of music: Intervals. Intervals are not simply, relative up and down notes. They are the very creative contextual ‘sea’ of anywork. Their conversation colours our emotions and plays with our emotive context. They are the pieces by which the listener is journeyed through a composer’s work. I’ve created a relative boat that they twirl around. We could have rough seas, calm seas, but either way, the sea never remains the same. It wil continue on until the work is complete. We can only ride along within their contextual relativity. 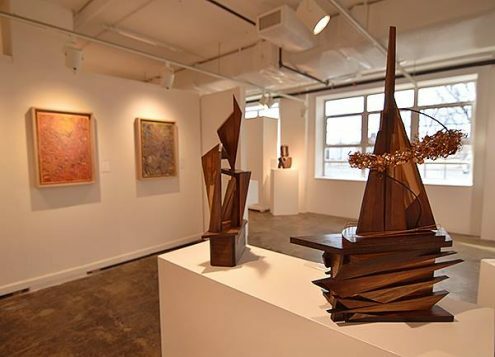 The show examines work from six artists utilizing metals in their process highlighting the allure, complexities and innovations of the craft. 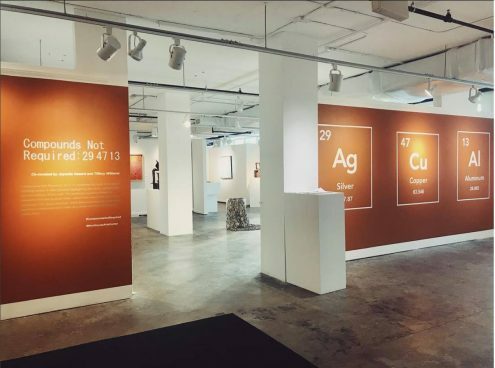 The exhibition explores metals as elements from the periodic table, specifically copper (29), brass, silver (47), aluminum (13), and steel; while demonstrating how these small physical components both make up a whole and have the power to stand alone. Compounds Not Required. Patrons looking at Britt Conley’s Chopin Etude #12 from Opus 25. 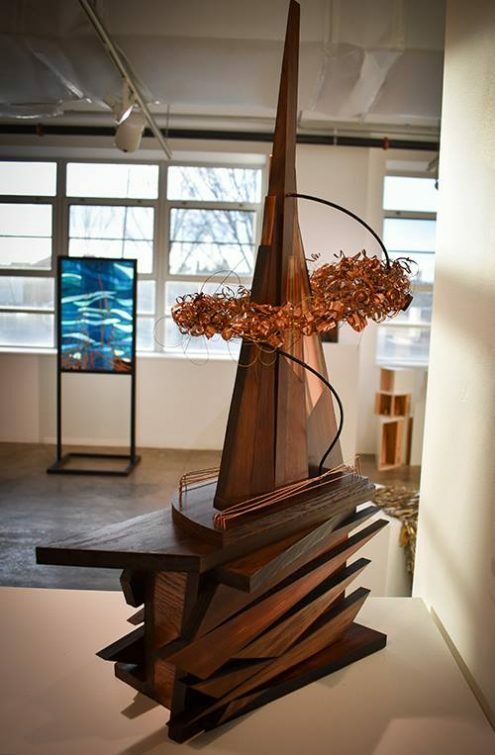 Each of the sculptures I’ve entered, incorporates copper as a way to move ones eye around the work and highlight the structures and relevance of the musical works. 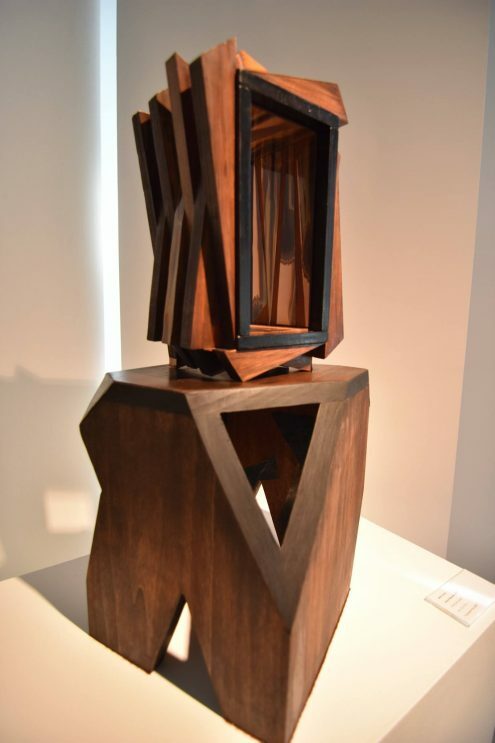 Danse Macabre has copper that mimics the wood grain. Surprising glints of light appear as one walks around it. I’ve added the element of surprise, throughout the work, by addding surprising windows that bring the viewer in with their own curiosity. CamileSaint-Saëns original musical score, the “DanseMacabre” traps the listener with a circular complexity that whirls one into a beautiful and poignant dance of internal surprises. The listener is journeyed through, but not alow to stay. Tchaikovsky made only one violin concerto, but it is the very measure by which we determine violin virtuosity. 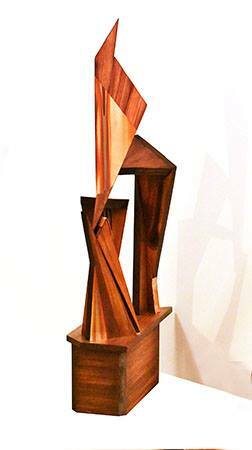 With this work I am attempting to capture the shapes of each movement and the work’s atenuating, musical runs. His compelling structure is unexpectedly towering. 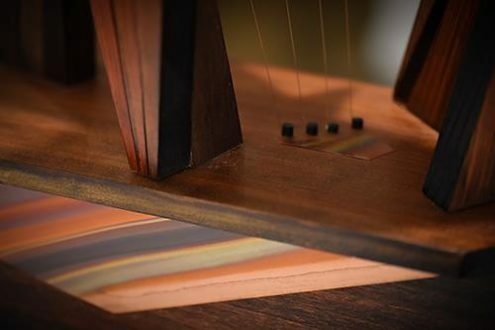 The Work also utilizes copper and copper strings to represent the violin sounds. Aside from the sculptures I also added three 3-dimensional paintings, also representing particular pieces of music. Chopin’s12th Etude Opus 25, ,is a study in forward momentum, loud chordal arpeggiations with a melodic inertia that pierces into ourconsciousnes. The pianist quickly moves us through the octaves while the melody simply hovers spaciously, between elegant, raw turmoil. This etude exudes the beauty of emotion within Chopin’s fuly motioned, ‘Ocean’ of sound. I’ve added paino wire to accentuate the beauty within the rhythm of the work. 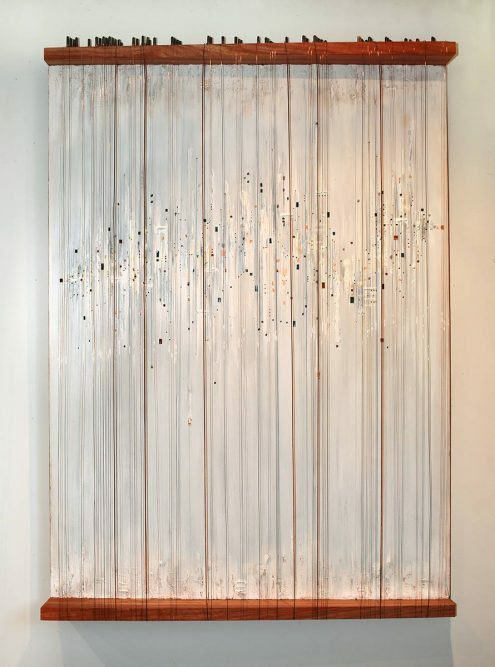 Each of the elements upon the oil painting surface are copper with patina and copper based metal additions. Johannes Brahms: Feldeinsamkeit, Op.86, No.2 by Britt Conley. Oil and pen on Canvas, copper patina ,copper wire, phosphor bronze, steel and wood on canvas. Surrounded by ceasless chirping of the crickets, Enmeshed wonderously by Heaven azure. The beautiful white clouds are moving, Through the deep blue, like lovely quiet dreams. 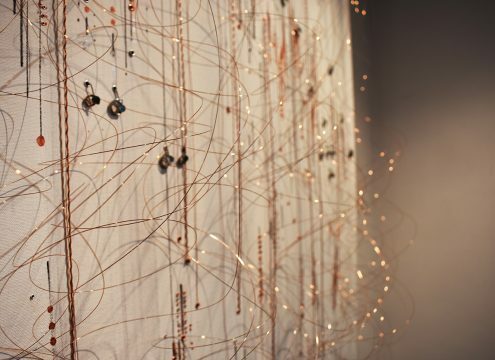 I used copper wire in many ways throughout the work to represent the singing crickets and steel with copper eyelets to express the melody. The white space is Brahms’ spatial ambiance. The final work from the show is Debussy’s Sunken Cathedral. The cathedral is unsoldered copper. 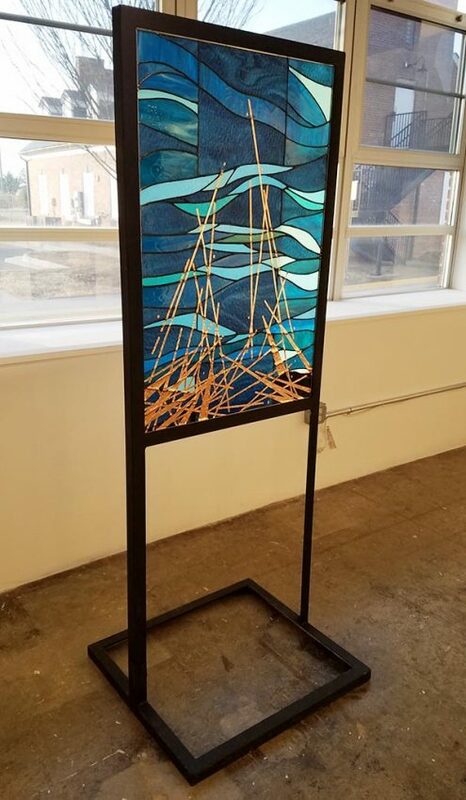 The rest is stained glass. I created it for the concert at the Masonic Temple in June. The panel went very well. 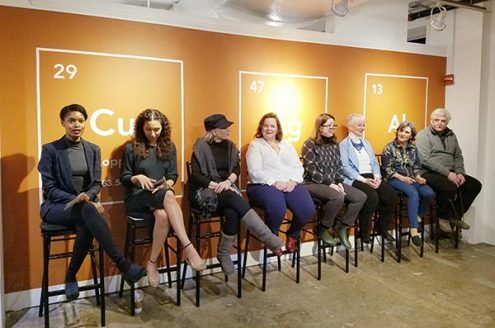 The panel featuring all of the artists. It was really wonderful to have my father and sister there. 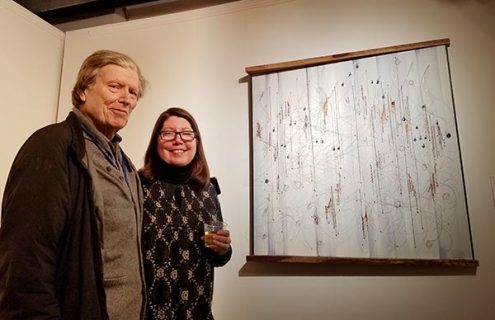 Harald Malmgren and daughter Britt Conley infront of her work. Overall, the exhibit is really nice. I did not get a chance to photograph everyone’s work but will update this post soon, with more from everyone. In the meantime, please come by to see the show! 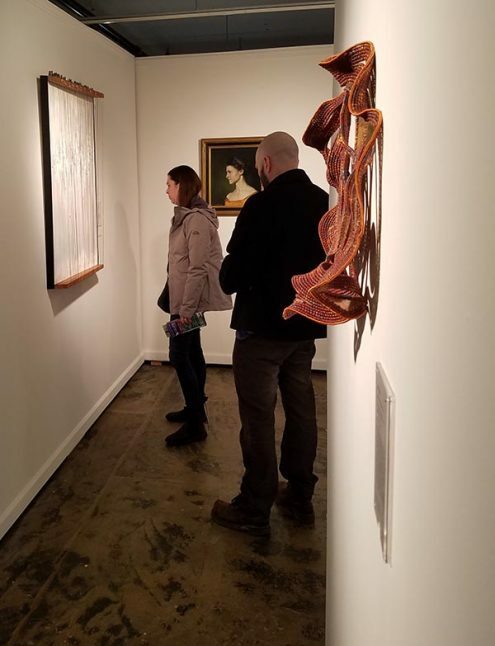 It’s on view until March 4th, 2018.